Hiding the “My WebLink” option from the Folder Browser. Hiding the Records Management Search. Defaulting to the thumbnails view in the Document Viewer. Defaulting to the full screen view in the Document Viewer. Disabling the rendering of tags. Customizing a particular field display. The last two items on this list rely on a technology called extensible stylesheet language transformations (XSLT). 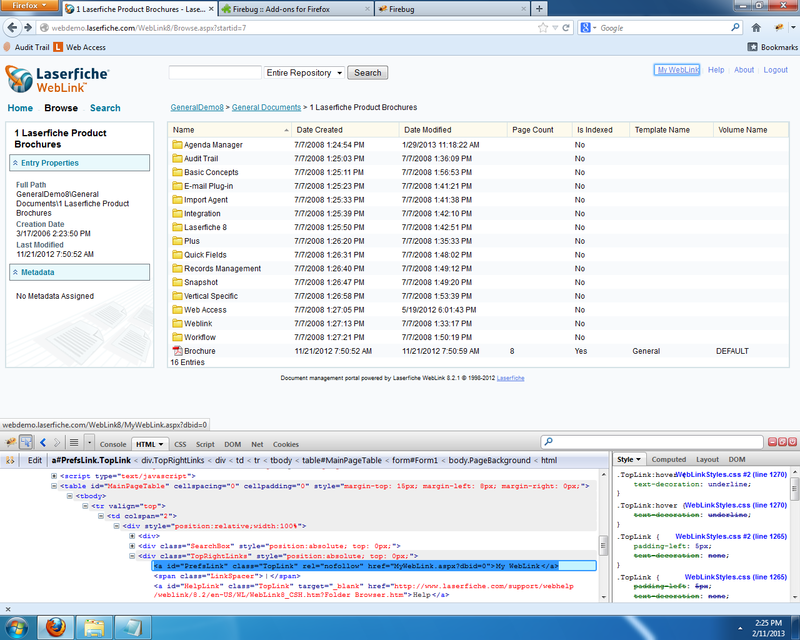 XSLT is used by the backend Laserfiche WebLink code. Install a browser debugging tool. For the purposes of this article, we used FireBug for Mozilla Firefox. Modify the application code to hide/alter this element. Make sure that all Web files are backed up in case it is ever necessary to revert to the original configuration. Document all of the changes to the files. 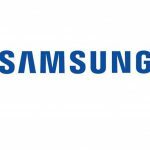 Upgrading may break some customizations and good documentation will allow for these customizations to be quickly reapplied. 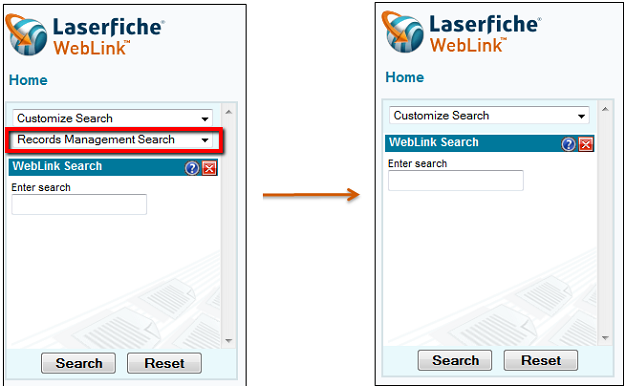 Some organizations may want to limit their WebLink users to using only the regular, Laserfiche search. They would like to have the “Records Management Search” option completely hidden. 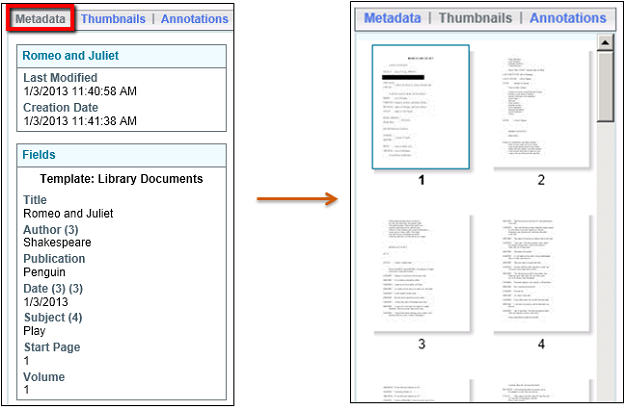 By default, when a document is viewed in the Document Viewer, the Metadata Pane is displayed. Occasionally, the thumbnail view would be more useful to particular users. It is possible to make the thumbnail view the default view in the Document Viewer. Sometimes, users will use Laserfiche WebLink solely to view the document image. These users may not even need to see the metadata or thumbnails. 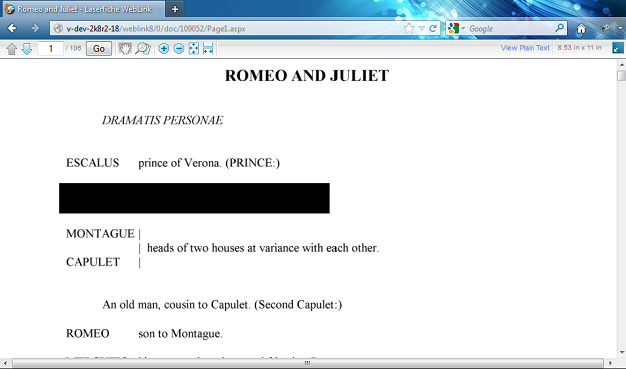 It is possible to customize the Document Viewer to automatically default to a full screen view. To default to the full screen view in the Document Viewer, find the DocView.aspx file and add the following code within the $(document).ready block. Informational tags can be added to documents in order to categorize them or aid in internal searches. 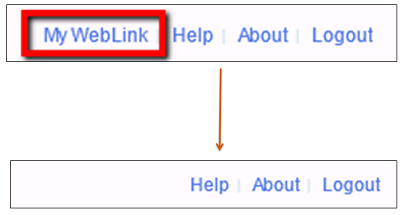 Informational tags are also displayed in the Laserfiche WebLink Metadata Pane. Sometimes, these tags do not need to be displayed to WebLink users. It is possible to make the “Tags” section completely disappear in the Metadata Pane. 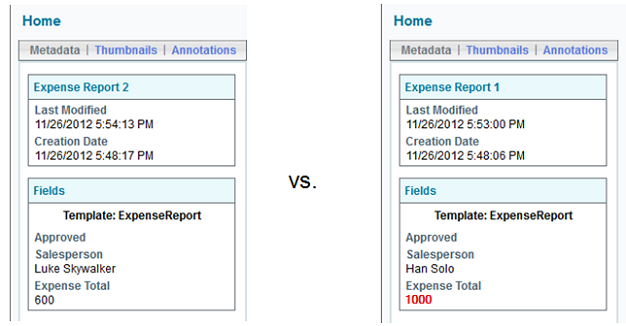 In the Metadata Pane, all fields applied to the particular document are listed in a uniform format (black text on a white background). A Laserfiche administrator may like to alter the display of a particular field to make it stand out. 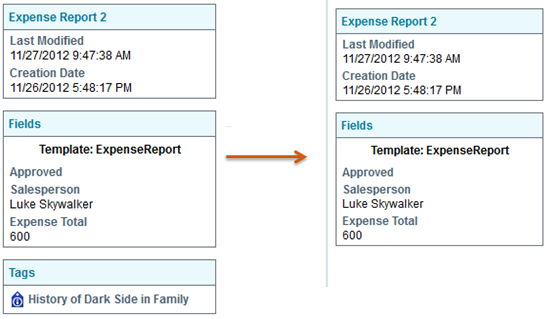 For example, a template for all expense reports has an “Expense Total” field. When accounting managers view these expense reports, they would like to quickly see any unusually high expenses. In order to bring attention to these high expenses, it is possible to configure any “Expense Total” field with an expense over $750 to be displayed in a red, bold font.